Short breaks minimum 3 nights available all year. (Excluding Christmas and New Year). 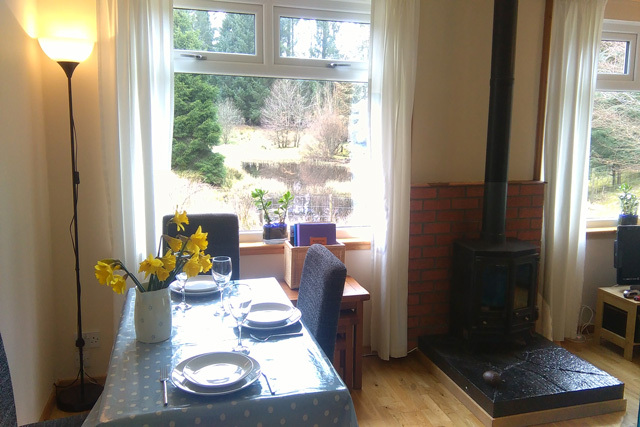 Oak Cottage is situated just over two miles from the pretty village of Killin, a traditional Highland village which centres on the spectacular Falls of Dochart, here the river tumbles and cascades over the rocks before flowing into Loch Tay. The village sits on the very edge of Stirlingshire’s border with Perthshire and benefits from being part of the Loch Lomond and Trossachs National Park. 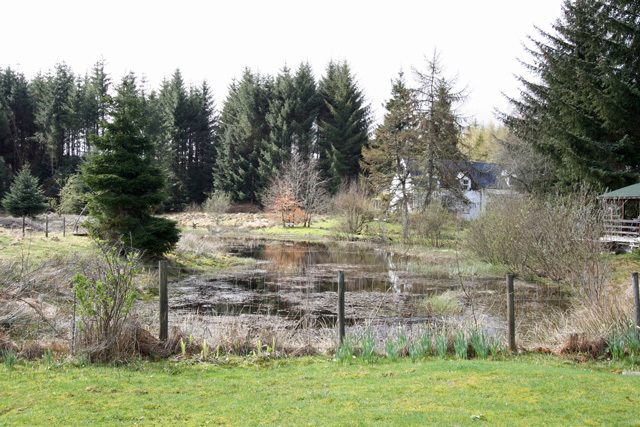 The property is situated in a quiet woodland setting and overlooks a private lochan. Furnished in a contemporary modern style and equipped to a high standard the property would make an ideal base for exploring this part of Scotland. On entering the property guests will find themselves in an open plan lounge with a dining area. 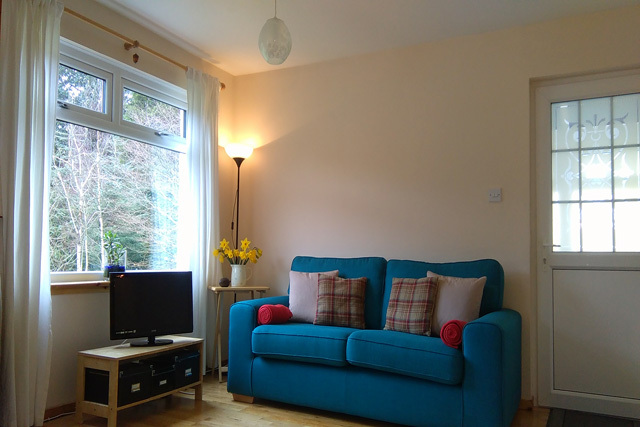 This room is bright and airy and has two windows overlooking the garden to the rear of the property. Furnished with comfortable sofas and a dining table for four, the room benefits from having a wood burner for those colder months of the year. Off the lounge is the modern kitchen area complete with all the usual kitchen equipment. A small hall leads to the two bedrooms, a double and another room which effectively can be a twin or a triple as it has a double with a single bed over. A family bathroom complete with a bath and shower over completes the facilities. The floors throughout the main living areas have been laid in a beautiful oak flooring and the bathroom floor is tiled. A particular impressive feature is the under floor heating in all the rooms, which is easily controlled by the thermostats throughout. Outside the garden area has seating and is an ideal place to sit and relax and reflect on the days activities. Situated at the geographic centre of Scotland, Highland Perthshire is within a two hour drive of the main cities of Glasgow, Edinburgh, Aberdeen and Inverness. Offering something no matter what your outdoor pursuit from the extreme water sports at Aberfeldy and Loch Tay to the more relaxed pace of life whilst enjoying a walk through the outstanding woodlands and forests or perhaps Glen Lyon often referred to as Scotland’s longest and loneliest glen. For the more agile perhaps hill walking on one of the local Munros, or mountain biking through the forests at Killin and over the Glen Ogle Viaduct and onwards to Balquidder, the route being a highlight of the National Cycle Network of Scotland. Killin itself is home to an interesting selection of small shops, cafes and restaurants, and the Killin Outdoor Centre and Mountain shop, a popular place for visitors as it has canoes, mountain bikes and walking equipment all for hire. They can also offer canoe trips on Loch Tay. For those interested in the historic aspects of the area the Scottish Crannog Centre at Kenmore on Loch Tay is well worth a visit. A Crannog was a type of ancient loch dwelling found throughout Scotland and Ireland, and the centre has an authentic reconstruction of one, along with many interesting artefacts. Fishing is extremely popular in the area the River Tay, Scotland’s longest river flows through the heart of Perthshire and is renowned as one of the world’s best salmon rivers and attracts anglers from all over. In the area there are various well stocked, trout fisheries and hill lochs. A good source of information about fishing in the area is the Fish Tay website, this excellent website is full of information about areas to fish, the permits required and the places where you can obtain them. The mountains and moors of Perthshire are abundant with wildlife, the Ben Lawers National Nature Reserve being a particular popular place to visit. Owned by the National Trust for Scotland the Reserve situated not far from Killin it is home to a diverse range of wildlife and during the summer months Ranger staff offer a programme of guided walks for visitors of all ages. 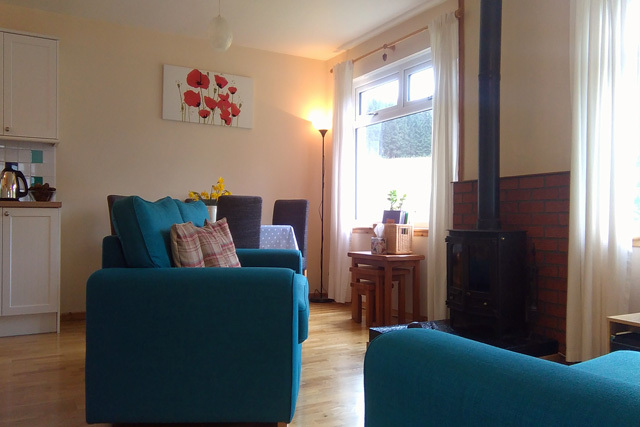 Open plan lounge/dining area, comfortable sofas, woodburner, table and chairs for four, Freeview Digital TV with built in DVD/CD Player, selection of DVDs and books. 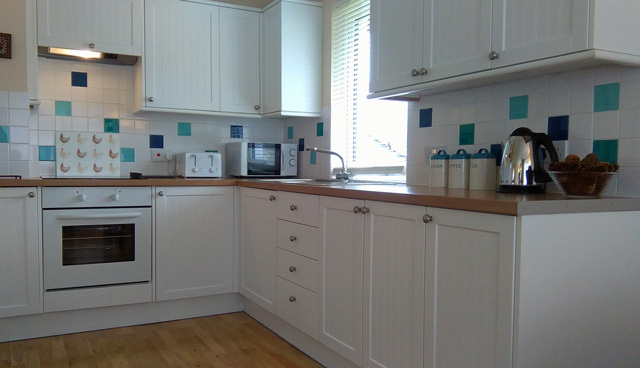 Kitchen with electric oven and hob, fridge/freezer, microwave, tumble dryer and washing machine. Second bedroom with double bed with single bed over. The lounge/dining area, kitchen and all the bedrooms have beautiful oak flooring with underfloor heating. The bathroom has a tiled floor and again benefits from underfloor heating. All bed linen, towels, electricity, oil and initial supply of logs. Additional logs can be bought locally. Cot (blankets and linen supplied) and highchair. Outdoor seating with garden furniture. Lockable storage facility for mountain bikes. 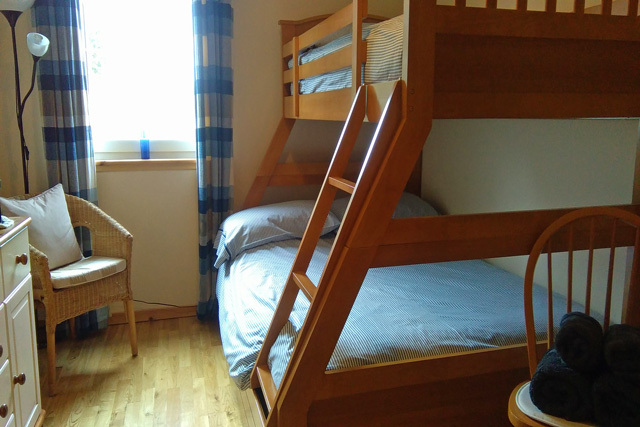 Located in a quiet spot but having the amenities of Killin close to hand. Ideal base for exploring Perthshire and the Loch Lomond and Trossachs National Park. Walking and cycling on the doorstep. We were delighted with Oak Cottage. 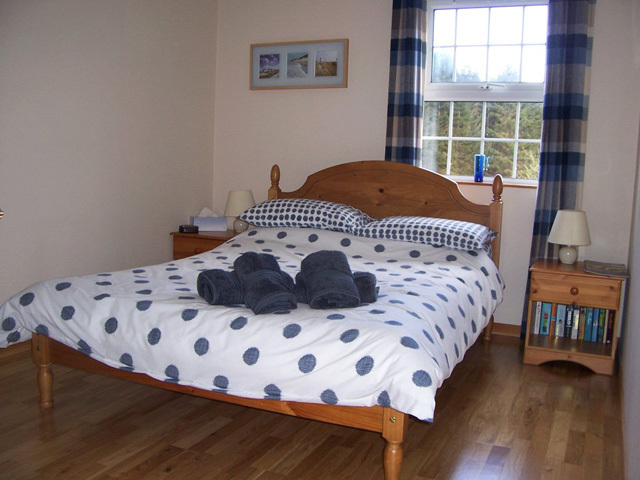 It was bright, clean, warm, cosy, well equipped and set in a lovely position to enjoy the numerous local wildlife. Daily we saw red squirrels and numerous other birds. Also in the evening a group of deer. We hopefully will be back before too long. The owners Alma and Chris are very friendly and helpful. Absolutely perfect location.Quiet,peaceful ... underfloor heating took some getting used to, felt good though. Well maintained and clean cottage. Plenty of wildlife to see out of the front room window. Will most definitely be booking this particular cottage again! 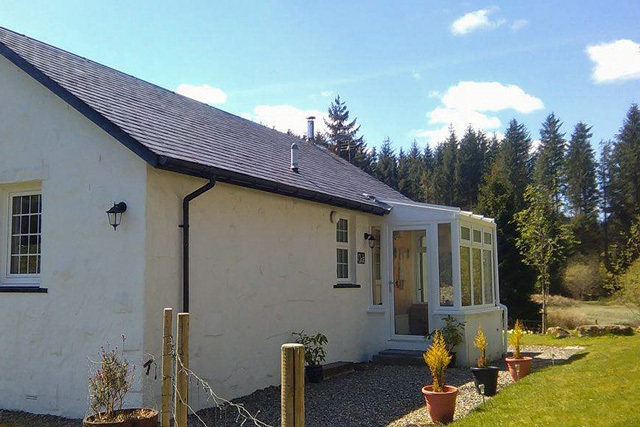 Oak Cottage is a lovely comfortable cottage and very well equipped and is the perfect place for a peaceful relaxing holiday with stunning scenery and fantastic wildlife from the windows. It is a good base for exploring this beautiful area of Scotland. We liked our stay at Oak Cottage. 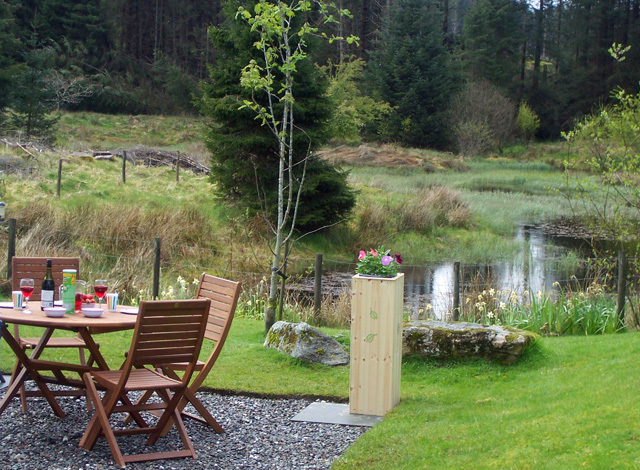 Nice cottage, with a great view on the surrounding wildlife right from the dining table. Thank you Chris and Alma for the nice gifts! Also we appreciated the good stock of maps and the folders with recommendations for hikes and walks in the area. We had a most enjoyable stay at Oak cottage, which we found to be very comfortable and well equipped. A highlight of our stay was the range of wildlife visiting the garden, encouraged by the bird and squirrel food provided by the owners. There was lots of interest to do in the area - Innerpeffray library, Cluny garden and Moirlanich longhouse were our favourites. 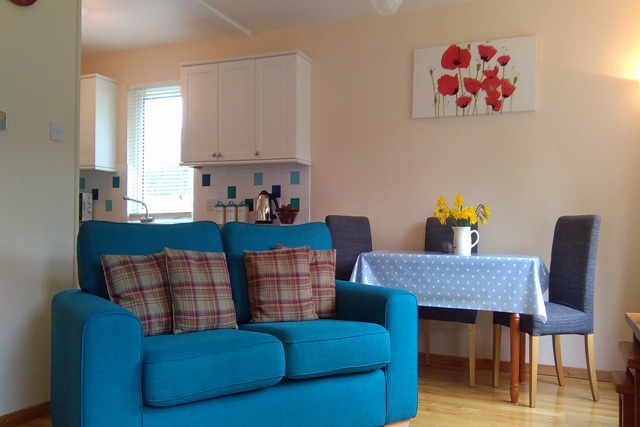 Oak Cottage is extremely well equipped and comfortable. The laundry facilities are particularly welcome in a wet Scottish summer. During our stay the neighbouring cottages had very quiet occupants and there was little noise from the nearby A84. 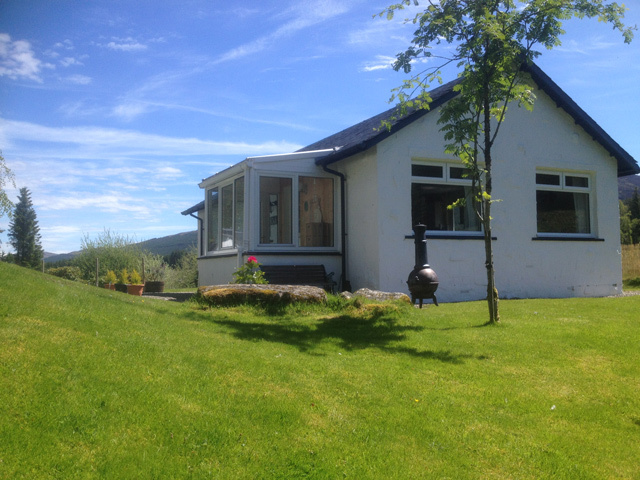 The cottage is very well placed for the Lawers, Crianlarich and Glen Lyon ranges. Phone reception is reasonable but not internet. Wifi connection would be welcome. Oak Cottage is a marvellous holiday cottage with everything suppied. Comfortable and warm with lovely views and wildlife. We would recommend it to all holiday makers wishing to have a lovely holiday in Scotland.....we shall return! We spent a week at Oak cottage, and hopefully we will come back next year. The cottage is excellent, fantastic and well equipped in the middle of the beautiful nature. We had a surprise when we arrived- a Welcome pack with a nice card.We recommend to everyone to spend holiday here at Oak Cottage. You can enjoy the nature, little friends (squirrels, rabbits, birds, etc) and fantastic walks around. Oak Cottage near Killen is lovely - so clean and well presented. Wood burning stove was really cosy and the welcome pack was a lovely surprise - really thoughful. The views from each room are stunning and lots of wildlife to spot including deer, stoat, red squirrel and rabbits plus lots of birds! Quiet, peaceful but not isolated and the weather was lovely too!! Loved staying here. It's very cosy and extremely comfortable.Everything is of the highest standard, perfectly clean and well-maintained. The underfoor heating was brilliant over a chilly weekend.It's one of 4 cottages all close together, which isn't mentioned on the website. The welcome basket was much appreciated. Wish we could have stayed longer than just a weekend!